During the season of sharing and caring, the YWCA TechGYRLS program of Bristol recently dropped by Strongwell’s offices and manufacturing floor with local holiday cheer. 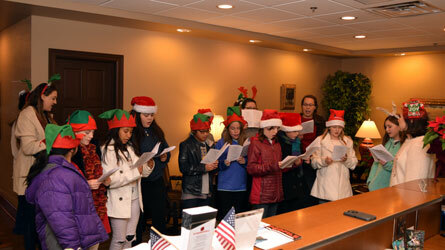 Over a dozen students and staff members from the YWCA filled the halls with holiday classics such as Rudolph the Red-Nosed Reindeer, Jingle Bells, and Santa Claus is Coming to Town. Strongwell’s own employees joined in as background singers. As a token of appreciation, each staff member and student received a treat bag to take with them as they caroled throughout the community. Many thanks to the YWCA staff for continuing and providing this musical tradition over the holidays to local businesses in Bristol.